Just like any other day a bunch of awesome new Cydia tweaks were released in the jailbreak store while others were updated to add compatibility for iOS 8. To make it easier for you to follow all the releases we do a roundup listing the tweaks that have been newly added to Cydia. Today is no different as we feature the newly released DreamBoard, CSwitcher, CyDelete8, CCClockOpenToAlarm8 and AppSync Unified 5.1. All of these hacks are now downloadable from Cydia. 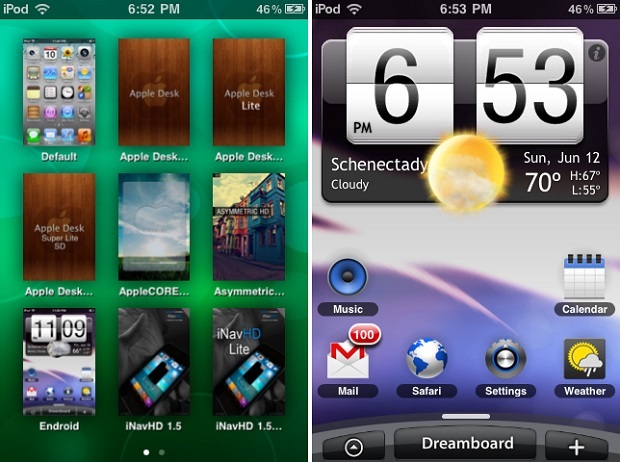 DreamBoard is an advanced themeing platform for iOS and is a great alternative to WinterBoard when it comes to customizing the look of iPhone or iPod touch’s user-interface. DreamBoard recently got updated to bring full support for iOS 8 allowing users to apply themes, add widgets and do styling on their springboard. One thing that makes DreamBoard different from WinterBoard is that it runs the themes in a shell and isn’t as powerful as WinterBoard. However some of its themes are much more advanced and full of features compared to WB. You can download DreamBoard for free from Cydia. CSwitcher essentially brings the iOS app switcher to the control center making it possible for users to switch between opened apps and close them right from the CC. You can choose from icons or app previews as shown in the screenshots above. You can close any app by tapping and holding on any app’s icon and then tapping on the ‘x’ button. 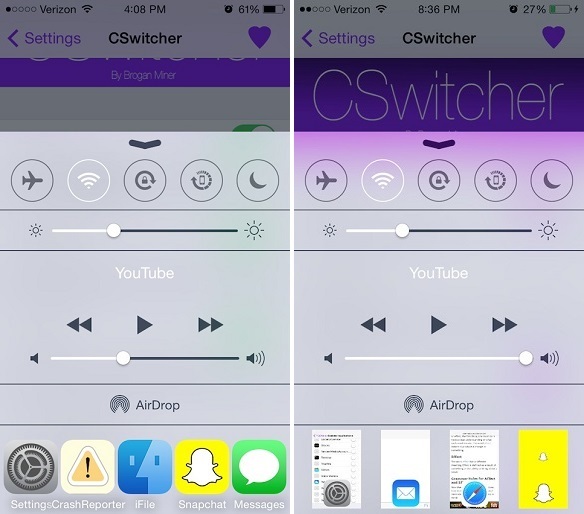 CSwitcher was available for iOS 7 already and it recently got updated to bring iOS 8 compatibility. You can download it for free. CyDelete8 is one of the most useful tweaks for Cydia. This hack allows users to delete apps downloaded from Cydia directly from the homescreen. Normally, unlike the App Store apps you have to open Cydia and uninstall the applications downloaded from the store. But with CyDelete8 you can do it directly from SpringBoard by entering the wiggle mode and tapping the ‘x’ button. The Clock button in the Control Center quickly opens the ‘Timer’ screen of the clock application. CCClockOpenToAlarm8 changes that behavior by opening the ‘Alarms’ screen of Clock when you tap on that button. Personally I prefer the Alarm option as I hardly use the Timer on my iPhone. 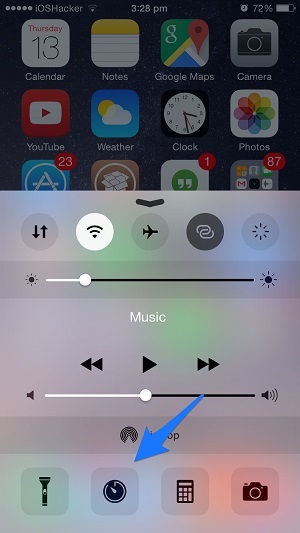 If you are like me then you would love this tweak. You can get CCClockOpenToAlarm8 tweak from Cydia for free. You need to add http://cydia.myrepospace.com/wmuff/ to you sources. A few weeks ago we told you about AppSync Unifed beta for iOS 8. If you are interested in that tweak then you would be pleased to know that the final version of the hack, AppSync Unified 5.1 has been released and it is now available for download in Cydia. You need to add http://cydia.angelxwind.net/ to your sources to get it.